All the materials available either in solid, liquid or gaseous form are made up of atoms, the smallest indivisible particles. Atoms of the same element are identical to each other in weight, size and all properties, where as atoms of different elements differ in weight, size and other characteristics. The size of the atoms is of the order of 1 Å (=10-10 m). A material which consists just one type of atoms is called element. Nitrogen, carbon, hydrogen, aluminium, copper, gold, iron etc., are few examples of elements. Group of atoms which tend to exist together in a stable form are called molecules, e.g. H2, O2, N2 etc., Large number of molecules in nature exist as combination of atoms of different elements, e.g water (H2O), etc. Molecules containing one atom (known as monoatomic), two atoms (known as diatomic), three atoms (known as triatomic) or more atoms (known as polyatomic). Rutherford and coworkers have shown that the mass of the atom is concentrated at the centre of the atom, called nucleus. The tom essentially has an electrical structure and is made of smaller particles, the principle one being electrons, protons and neutrons. Nucleus: the nucleus is at the centre of the atom and consists of protons and neutrons. Its diameter is 1/10,000th of the atom as a whole. Almost entire mass of a given atom is concentrated in its nucleus. Due to the presence of protons nucleus is positively charged. The number of protons in the nucleus is equal to the atomic number of element. A neutron is an uncharged particle and has same mass as the hydrogen nucleus. The nucleus of hydrogen atom is called the proton. A proton has a unit positive charge of same magnitude as that of electron (= 1.602 ´ 10–19 C). The mass of a proton is 1.672 ´ 10–27 kg. The proton and the neutron are considered to be two different charge states of the same particles which is called a nucleon. The number of protons in a nucleus is called the charge Z of the given nucleus, or the charge number. M. Faraday in 1983, in his experiments on the laws of electrolysis, provided the first experimental evidence that electrical charge was not infinitely divisible, but existed in discrete units. Possess high kinetic energy and can induce chemical reactions, excite fluorescence on certain substances. These properties of the cathode rays were best explained by J.J. Thomson by his hypothesis that the cathode rays consist of a stream of particles, each of mass 'm' and charge 'e' (= 1.602 ´ 10–19 C), originating at the cathode of the discharge tube, These particles are called electrons. An electron is a negatively charged particle present in an atom. 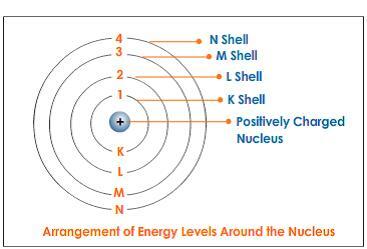 The number of electrons which surrounds the neutral atom is equal is the number of protons within the nucleus, i.e., the atomic number the electrons move about the nucleus. The orbit or shell nearest to the nucleus known as K-orbit contains 2 electrons, the next (L-orbit) eight electrons and next (M-orbit) eighteen electrons and so on. The sub-shell is known as S-sub-shell. The symbols 2S, 3S, 4S ........ denoted that S-sub-shell of the first, second, third, and fourth energy levels respectively. The sub-shell is known as P-sub-shell. The symbols 2P, 3P, 4P ........ denoted that P-sub-shell of the first, second, third, and fourth energy levels respectively. The sub-shell is known as d-sub-shell. The symbols 2d, 3d, 4d ......... denoted that d-sub-shell of the first, second, third, and fourth energy levels respectively. The sub-shell is known as f-sub-shell. The symbols 2f, 3f, 4f .......... denoted that f-sub-shell of the first, second, third, and fourth energy levels respectively.